The Aston Martin V8 engine was originally defined and specified during 1963 as the DB5 was being readied for production. From the outset, conceived as a V8 of greater than 4 litre capacity, it incorporated many of the same technical and physical features of its predecessor, particularly, cylinder block design. This eventually resulted in an engine of 6 litre capacity. 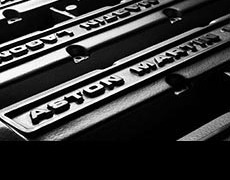 Early Aston Marttin V8 engines were capable in carburettered tune of around 310 bhp and 300 ft lbs of torque. With the introduction of the Vantage, power grew to 380 bhp and the X-pack still further to a reliable 430bhp. Aston Martin further developed the V8, introducing an enlarged 6 litre design, and with the Vantage 550, twin superchargers with fuel injection producing an astonishing 550 bhp and in excess of 500ft lbs of torque! 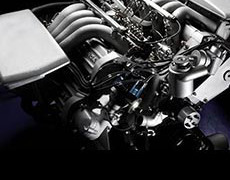 From the foregoing, it is quite possible to produce engines, which provide a substantial increase in power and torque simply by modifying engines to an established design specification. As a general rule, therefore our standard fast road engine is basically common with the V8 X-pack, the X-pack engine being a later development of the Vantage engine that went into production in 1977. With lightweight low friction pistons, electronic ignition, revised camshaft timing and porting, these engines develop around 430 bhp and 350 to 370 ft lbs of torque totally reliably and with excellent flexibility and smoothness. The fast road options above retain the original stroke of the engine, and because of that, it is possible to retain the original crankshaft and con rods and thereby, limit the costs of the upgrade. However, the decision to retain or replace these depends critically on condition. A new crank and rods may be desirable with the 6 litre option. A simultaneous engine overhaul, which would be desirable anyway, will involve new liners and pistons. All of the fast road options require extensive changes to the cylinder heads, from enlarged valve seats, valves, springs and cam followers to gas flowing of the inlet and exhaust ports and new camshafts. New lightweight forged high compression pistons are also required. The standard Vantage carburettor is the Weber 48 IDF with Vantage standard inlet manifolds. A set of enlarged bore exhausts manifolds are also required to compliment changes to the cylinder head. The standard 5.3 litres V8, whether in carburettor form or as with the |Series 5 V8, fuel injection, starts as a highly flexible engine with abundant torque from as low as 1000 rpm. It is also a highly refined engine. Improvement to the inherent reliability of this engine needs, therefore to be in the areas of ignition and cooling predominantly. Improvement in general refinement is based on ensuring that the balance of the engine is optimal and this is best ensured during an engine rebuild. The standard transmission, whether Auto or manual, will be capable of accepting the considerable increase in torque and power that comes from the Vantage engine. As always, the proviso must be that it must be fully serviceable and in good repair. However, the proviso, with the automatic gearbox is that the size and capacity of the standard transmission oil cooler must be increased. On manual cars, a heavy duty clutch must be fitted.. The final drive differential carrier and its supporting cradle will need to be strengthened. In very hot climates, it may be advantageous to install an final drive oil cooler, for which we have an established scheme and installation kit. Finally, consideration should also be given to modifying the final drive ratio, where this may offer useful advantages. The standard V8 uses 225/70 15 tyres with a 6.5 J wheel width.. This needs to be increased to cope with the additional torque and power available. The Vantage specification calls for 7J wheels with 255/55 16 tyres. The Aston Martin V8 has shown itself to be adaptable to a bewildering range of options, with some versions having been developed from the standard 5.3 litre V8, through capacity increases to as high as 7 litre and with a variety of fuelling options ranging from up rated carburettors to single and double superchargers and to power and torque figures of 600bhp and 500ftlbs of torque. These are massive increases from the standard engine, which develops around 320 bhp and produces around 250 to 260 ft lbs of torque. Our policy at the Aston Workshop is to offer options that we feel confident that we can do from within our own resources and capabilities. We therefore limit what we offer to a maximum size of 6.3 litre with a minor increase in stroke and limited increase in the bore size. The engine configuration is geared to maximising usable torque, rather than power and target figures would be around 450bhp and 380 to 400ft lbs of torque. If even more power and torque is desired, however, than we would source already developed upgrade kits from other specialists and the potential range of these are large.